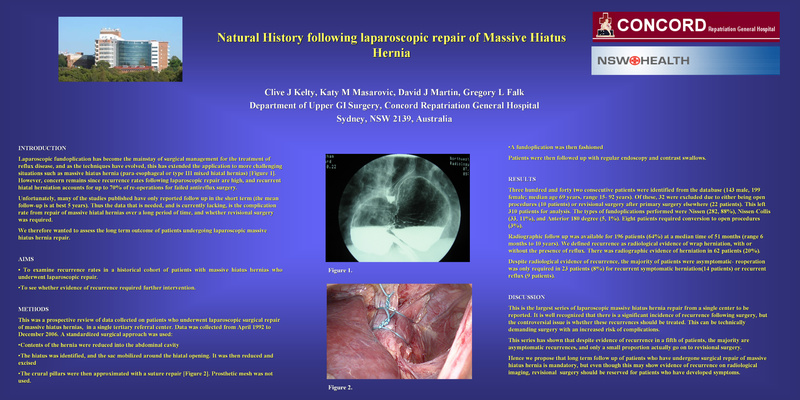 Methods: Prospective review of patients operated on for massive hiatus hernia between April 1992 and December 2006 in a tertiary referral unit. Principles of repair included reduction of the hernia, approximation of the crura, and fundoplication. Patients were followed up with gastroscopy and contrast swallow studies. Quality of life was also assessed. Results: Three-hundred and thirty-two consecutive patients (139 male, 193 female; median age 69 years, range 15- 92 years) were evaluated. Twenty-two patients had undergone surgery elsewhere, 10 were performed as open procedures, leaving 300 for analysis. Fundoplications were Nissen (264), Anterior 180 degree (3), and Nissen-Collis (33). Eight (3%) were converted to open procedures. Radiographic surveillance was obtained in 202 patients (67%) at a median of 54 months (range 6 months to 10 years) postoperatively. Sixty-two patients (21%) had radiographic evidence of a recurrent herniation or wrap failure. Reoperation was required in 23 patients (8%) for recurrent symptomatic herniation (14 patients) or recurrent reflux (9 patients). Patients with abnormal postoperative contrast swallow studies who did not require reoperation have remained asymptomatic at a median follow up of 48 months.